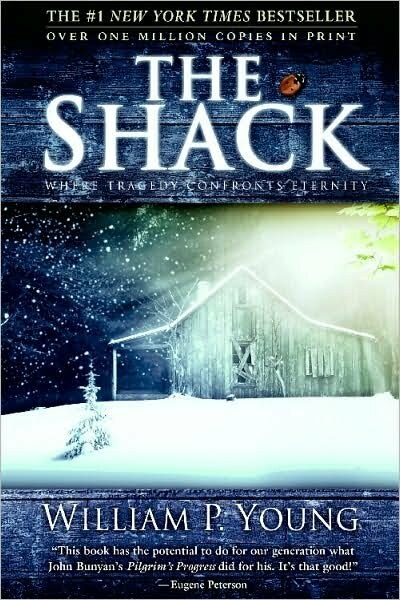 Chances are good that you’ve heard about William Young’s book The Shack. And chances are even better that you’ve heard one of two assessments about it — it is a lifechanging work of Christian fiction or is a complete and total heresy. It’s difficult to read a book that evokes such strong opinions without bringing your own presuppositions to the text. But I tried my best. The story follows the spiritual journey of Mack Phillips, a father who struggles with his faith following the abduction and assumed murder of his youngest daughter. Readers are shown a vivid picture of what happened during that fateful camping trip, the days that followed, and the mysterious card left years later for Mack from an even more mysterious “Papa” who calls him back to the scene of the murder. From there the book reads like a discussion of theology, as Mack encounters three persons in one — Papa, an African American woman, Saruya, an Asian spirit-like thing (for lack of a better description), and a very human Jewish handyman named Jesus. Through their time together, they lead Mack from his “Great Sadness” to a new, vivid relationship with them. Like I said, it was hard for me to come into this without any opinion. I knew some of the complaints more conservative readers had about it, so it was difficult to see what made this book a bestseller at first. After reading it, though, I can see why it would appeal to so many people, Christian and non-Christian alike. It was a very imaginative story that tugged on your heart from the very first chapter. (Especially as a parent to small daughters!) The depiction of the members of the Trinity left you feeling as though the Godhead was genuinely enamored by you, that you were the crowning achievement of Creation, and that no matter what evil befalls you in the world, God has the victory in the end and that victory is in loving you to greater completion in Him. All very fine truths that can be found in Scripture… but there were subtle nuances and outright lies alongside these truths that made this book dangerous reading for someone who might be new to the faith. In Young’s defense, though, I’m not sure how anyone can write God as a character apart from the text of Scripture without allowing, albeit probably unknowingly, unbiblical notions creep in. I myself wrote a play in college that, while true to Scripture, still managed to make Jesus less than who Scripture shows Him to be. How can we portray God in our writing better than God portrays Himself in Scripture? We just can’t. Such is being human and all, right? The greatest complaint I heard about this book coming into it was that God is portrayed as distinctly feminine. Well, there’s no arguing that Young uses an African American woman to speak for God, but his reasoning behind this is that God is not some old, bearded, white man and that to imagine Him as what we’re prone to imagine Him as, is akin to putting Him into a box. He’s right on that count, but to portray Him as any human other than Christ Himself is putting Him into a box as well. That said, I would not have been as troubled by this portrayal had Papa been a distinctly strong and masculine character, apart from gender. There is no denying that God is NOT feminine in Scripture, and while He has no gender as we understand gender, His character, as defined by Scripture, is distinctly masculine. Ladies, you can stomp your feet, yell, and get all angry about the “unfairness” of it, but that won’t change Scripture. God is not feminine. Simple enough. On the issue of authority and submission in the Trinity, the book insists that there is nothing but complete and total equality within the Godhead, resulting in mutual submission. When Mack questions how this could be, he is told that the only reason he can’t imagine the Trinity without any order is because he is human. And while I certainly can’t divorce myself from being human as well and tend to agree with Mack’s protests, I find issue with this lack of Trinitarian hierarchy in Scripture. Christ clearly submits Himself to God and the Spirit submits Himself to the Son. I find even greater issue when, at one point, Jesus tells Mack in no uncertain terms that the Trinity submits itself to mankind. This is just a continuation of the idea of mutual submission, elaborating that once we are in Christ and know the Father as Christ knows Him that we will ALL mutually submit to one another. WE WILL NOT. God does not submit to man. Man submits to God. Even as Christ submitted to death at the hands of men, He was not submitting to man but to the will of God. To suggest that God will at any point in time submit to ME is making myself at the very least equal to God (if not greater! ), which I AM NOT. In one puzzling conversation near the conclusion of the book, Jesus tells Mack that he isn’t looking to make Christians out of people. He says that He has followers from all religions and that He wants people simply to know and love Him, not become Christians. Perhaps this is just an issue of semantics and an indication of our current culture, where even Bible-believing Christians seem at times hesitant to place a label on themselves, even going so far as to refuse to call themselves “Christians.” I’ll assume that it is and that Mr. Young isn’t doing what it certainly sounds like he’s doing — syncretizing all religions into one. If “Jesus” meant through this conversation that He has followers who have COME OUT of false religions, that’s one thing. And praise Him for calling them out! But if He meant that He has followers who are still FOLLOWING false religions (cultural Christianity apart from true redemption included, mind you! ), then this is a lie. Christ demands that we worship Him exclusively, and there is no room for other beliefs when Christ has complete Lordship. I’m reminded of a Japanese gentleman we knew who wanted to know about Jesus so as to include Him with the many other gods he worshipped in his postmodern cabinet of deities. I sincerely hope that Mr. Young would not categorize this man, and others who continue to follow false religions, as a follower of Jesus, but this particular conversation in his text certainly leaves it ambiguous. The book is not without its fine points, though. When faced with judgement, (ironically where Mack himself is the one forced to judge), Mack realizes that ALL men are destined for Hell apart from the saving grace of Christ. At certain points in the text, I questioned whether Young actually believes that men are inherently good and deserving of grace, so I was pleased to read this section. Papa also tells Mack at another point that she did not need him, that she in herself as God was fulfillment enough, without mankind. During one of the conversations between the three persons of the Trinity, it is stated that Christ was a totally limited human. (He even breaks a dish, much to the amusement of God and the Holy Spirit.) I know this point likely got some readers I know all stirred up, but Scripture does teach that Christ emptied Himself and became fully human while here on Earth. His miracles are made even more miraculous in light of this, as we realize that it was His matchless faith in God and God’s working power through Him and not His power in and of itself, that made it possible. These are very real truths we see in Scripture, and their inclusion in the story was a great surprise. While this book was very well written, I will not be recommending it to anyone else. There are good points, but those good points are interlaced with enough wrong views of who God is that I feel ill at ease with it as a whole. Like I said before, though, I’m sure Mr. Young’s intention was good, but it might very well be impossible to write a better description of God than what God Himself has already written in Scripture. If you want to know who God is, what He would say about your suffering, and what His plan is for you, you’re better off reading your Bible. Have you read The Shack? What were your thoughts? It's ok that you won't recommend this book, I know a multitude of people that will. It is so much to so many and that is all that matters. I would argue that what REALLY matters is clear, biblical representation of who God truly is, something that this book misses. Something that attempts to teach theological “truth” that is contrary to Scripture is dangerous. Excellent review, Jennifer, you echoed all of the same concerns I had when I read it. The submission thing particularly stuck out to me as well as the “followers from all religions” point. I'd never go as far as to call the book heresy, because the author never purports it as non-fiction, but it's definitely dangerous reading in the wrong hands. I heard the hype about this book and could not wait to read it and contrary to many who said they were mesmerized and could not put it down, I struggled to pick it up and read it and finally just gave up about 3/4 of the way through it. This book contains kernels of truth and twists those tenets into deceitful lies about all roads leading to the same place and I am my own god and contain within me all the power to be what I want to be. This book and others of its type are dangerous as you and others say, especially in the hands of those not firmly rooted in the faith, because they distort and confuse the truth of the trinity and dilute the cornerstone of our faith, that there is ONE WAY to the Father and that is through faith in Jesus Christ alone….nothing and no one else. Thanks for exposing the heresies in this slick little book and not recommending it to others. I actually knew nothing about this book when I picked it up a couple of weeks ago, so I had no expectations when I read it. While there were things with which I disagreed and I didn't care much for the writing style, I appreciated the reminder that our relationship with God should be just that: a relationship. Well said! My concerns were the same as yours…intertwining truth with lies (including half-truths) is dangerous; and I've been saddened by the number of churches who will use such material to preach from rather than depending on what God reveals about Himself in Scripture; just because something is catchy and easy to understand doesn't make it true. In particular, the mutual submission thing stuck out to me, as well as the nail holes in Papa…I think Scripture is pretty clear that the Father turned His back on Jesus (which I think is probably the greatest pain suffered on the cross, far beyond the physical torture) and not that He was crucified there mutually. (I'm sure many would argue that this is one example of how confusing the trinity can be though…) Anyway, while I appreciated the storyline and the picture of God desiring and pursuing a relationship with us (as well as a few other aspects), I will never recommend it to anyone else and I don't plan on keeping my copy of the book for any future reading. My friend Shannon recommended your review to me, and I'm so glad she did! I really enjoyed it, and my concerns about the Shack were like yours. I read it just recently after hearing numerous friends praise it, and was shocked to read such New Age/universalist nonsense coming from the mouth of “God.” One thing that bugged me particularly was that in a book purporting to explain the “why” of suffering, Satan is never mentioned. In fact, Young implies that evil doesn't really exist..certainly no credence is given to an intelligent evil force that seeks to kill and destroy. Of course we can't blame every instance of suffering on the devil; we are responsible for a lot of it too, but you can't discount that. And like you, I was surprised at the irreverent tone. Not that I think Young was intending irreverence–he was trying to show the loving nature of God–but you cannot ignore the fearsomeness. When Job asked the same questions with as much bitterness and sarcasm, he shut up and sank to his knees when God answered forcefully. Here God makes scones for you before a big group hug. There is just one thing that I differed with you on–and unlike my dispute with Young, who flatly contradicts scripture, this is an issue where Christians have honest interpretation differences. I think that the book was wrong is saying that Jesus rejected His deity on earth. Certainly it was diminished, but He was still God. When He performed miracles, he used “I”–when the disciples performed them, they did them in His name. The idea that He could perform miracles just because He was the only human in perfect relationship with God smacks of “guru” philosophy or Mormonism.